King Trisong Detsen (Tib. ཁྲི་སྲོང་ལྡེ་བཙན་, Wyl. khri srong lde btsan) or Trisong Deutsen [Déu tsen] (ཁྲི་སྲོང་ལྡེའུ་བཙན་, Wyl. khri srong lde'u btsan) (742-c.800/755-797 according to the Chinese sources) – the thirty-eighth king of Tibet, son of King Me Aktsom, second of the three great religious kings and one of the main disciples of Guru Rinpoche. It was due to his efforts that the great masters Shantarakshita and Guru Padmasambhava came from India and established Buddhism firmly in Tibet. There is some confusion in the various histories regarding the number and the names of Trisong Detsen's sons. Mutik Tsenpo (མུ་ཏིག་བཙན་པོ, mu tig btsan po) who became known as Tridé Songtsen (ཁྲི་ལྡེ་སྲོང་བཙན་, khri lde srong btsan) or Senalek (སད་ན་ལེགས, sad na legs). the third son, who is called both Murug and Mutik. the youngest Mutik Tsepo, or Senalek Jingyön. 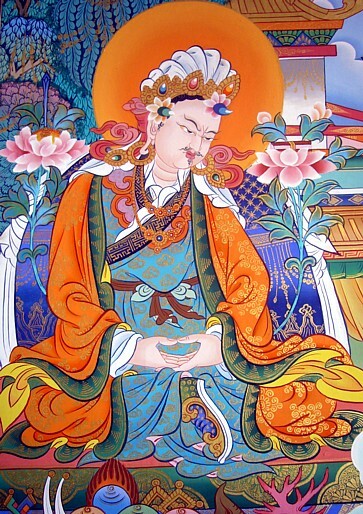 Princess Pema Sel first died at the age of eight, but was brought back to life by Guru Rinpoche, and entrusted with the complete Khandro Nyingtik cycle by Guru Rinpoche. She was later reborn as the tertön Pema Lédrel Tsal, who revealed this terma cycle of teachings. ↑ And historic sources such as The Red Annals and The Banquet for the Wise. ↑ See Brandon Dotson, “Emperor” Mu rug btsan and the ’Phang thang ma Catalogue, JIATS vol. 3, 2007, for a summary of Haarh's research. This page was last edited on 21 February 2019, at 04:08.